Aside for the occasional mealybug attack or overwatering episode, cacti and other succulents for the most part fall in the "get 'em and forget 'em" category. They are intensely resilient, thrive under benign neglect, and—if given bright light conditions and the right soil to start—are perfect for anyone who professes to be terrible with keeping plants in the home. Unfortunately because of that, succulents often go unnoticed. Meaning, we just don't spend as much time with them, as we would a more high maintenance or even photo-sensitive plant (I think a Calathea checks the box on both of those qualities). We tend to observe our succulents a lot less, because quite frankly—they don't mind being left alone. 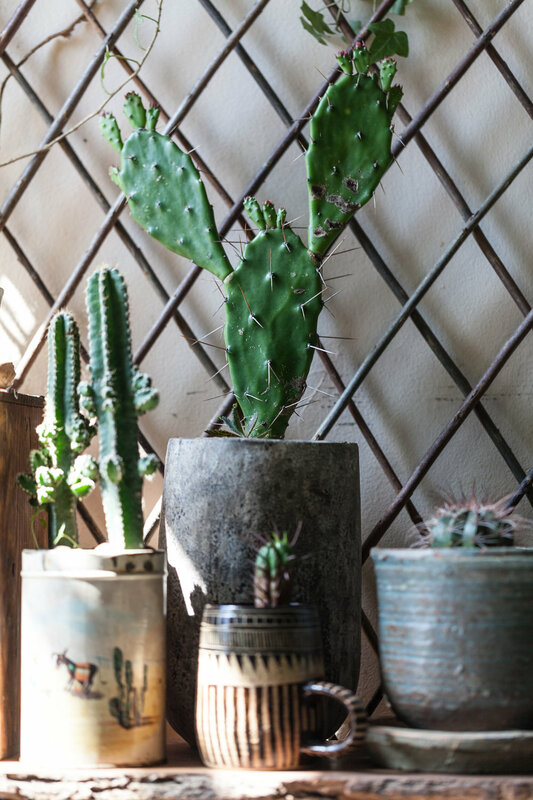 After I started my succulent tea garden and turned one corner of my bedroom into an area fondly now known as "Cacti Corner", I began to observe some more interesting characteristics from my prickly, swollen friends. I like to upcycle my tea containers and turn them into homes for succulents—so much so that now two shelves of my window in my green wall room are totally devoted to succulents in tea containers. My bunny ear cacti (Opuntia microdasys) seems to love the summertime sun, which is when it prefers to grow. A little snippet of love in my Cacti Corner. I began to notice that some of my succulents would shed their little leaves (in the case of my Senecio articulatus) during the summer months, and then shoot out tons of new leaves in the dead of winter in my drafty south-facing window. Or I would notice that some succulents would simply stop growing in the heat of the summer, just when you think they should be growing. This photo was taken in July 2016. Notice the Senecio articulatus in the upper left. It features just two bare and bulbous stalks. Additionally, look at my stemmy Kalanchoe daigremontiana, just two over from the S. articulatus. It's barely got any babies. What I was observing in my succulents was dormancy, or a cessation in plant growth, development and activity. I posted about this on my Instagram and got quite a response from it, so I decided that I should post about it more in depth. Dormancy, as many of us know, happens in almost every plant on earth. It's a way for them to store energy or to survive in more stressful times, including in extreme weather—be it extreme heat or extreme cold. Even baobabs (Adansonia sp. ), the iconic, towering tree-like succulents that I see on my journeys through Africa (or that we often associate on postcards of African sunsets), are leafless during most of the dry season. In fact, these stem-succulent varieties (ahem, like my Desert Rose) will often shed their leaves before a dry season and well before their non-succulent brethren. This may seem conservative, giving a succulent's bulbous storage units, but this is more of a ‘drought-avoidance’ strategy. Sunset on succulents. Seriously can't get enough of this gorgeous light. And quite frankly, neither can these succulents. During the winter months some succulents, like Euphorbia and Pachypodium, can slip into dormancy due to lower light. Whereas others are dormant in summer, like Kalanchoe and Aloe. This just means they've stopped growing, but evapotranspitation is still happening, so you'll need to water them. In winter, this means a lot less water, whereas those that are summer dormant will need far more water. I mention dormancy as an important feature in succulents, largely because it'd be a terrible thing for someone to throw out a plant simply because it shed its leaves—or try to withhold or conversely—provide too much water—thinking it will "revive" the plant. Understanding that succulents go into dormancy in different seasons, also helps us become more in tune with our plants' needs. Sometimes we buy succulents without even knowing their names or genera, and that can make it difficult—but not impossible to know when they will go dormant. You can simply look for the signs! One of the first signals that a succulent entering dormancy will exhibit is that it stops growing—completely. If they have fleshy leaves, like in the case of my Senecio, they'll simply become, yellow or brown and drop or hang limply off the sides of the plant stem. In some varieties, rosettes will contract. And if you have Mesembs of the Titanopsis genera, you'll notice they get a papery covering. I was once told by a prominent cacti grower to stop watering cacti pretty much from November to March; and water succulents only once every couple weeks in the winter. This is a good general rule of thumb, but it's a little more complicated than that because as we now know, different succulents go dormant different times of year, and the conditions that you put your succulents in differ. If you're in hotter climates, transpiration will still be occurring, so you may need to water them during the dormant season more frequently than you would in lower light, more humid conditions. Additionally, you should never repot a plant while it's "sleeping"...I mean, how would you like to be roused out of a deep sleep and be told to move to another home? Not very much, I surmise. Same goes for plants, particularly succulents. They would prefer to be repotted when they're growing, so at the first sign of growth, you should be safe to do some planter changes. These are plants that are considered "summer growers" and will enter a dormancy period generally from November to the beginning of March. These genera are normally considered “winter growers” and are dormant during the warmer months of May through August.